It didn’t take long for Jeff Heikes, Vice President of Project Management-Engineering, to know that POET was the right fit for this family man. It didn’t take long – it was during his first assignment at POET, in fact – for Jeff Heikes to realize that project management was the perfect fit for him. 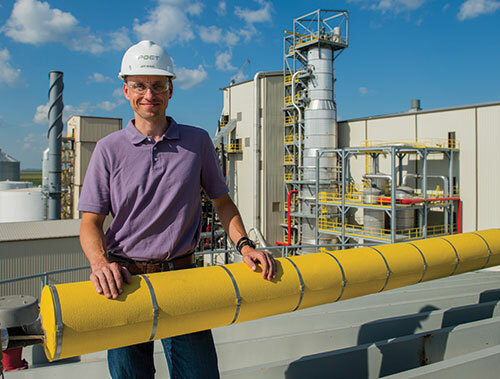 A dozen years later, Heikes (now POET’s Vice President of Project Management-Engineering) is about to help oversee the completion of arguably the largest undertaking in POET’s history, Project LIBERTY, the commercial-scale cellulosic plant slated to open this summer. While Jeff ’s passion clearly centers around his wife Doreen (a former POET employee) and two kids (7-year-old Allison and 5-year-old Emmet), it also spills over into things like his drive to exercise. And here’s all you need to know about that passion: During his triathlon training, Heikes often listens to podcasts … about triathlon training. You came to POET in 2002. When did you know this was where you wanted to be? JEFF: On my first day I got to shadow one of the project managers. My background is in chemical engineering [he graduated from South Dakota School of Mines and Technology in 1999], but I always loved the construction process, too. We went to Big Stone, South Dakota to commission that plant and I got to work with the engineers and contractors. That’s when I knew this was what I wanted to do. How did you meet your wife, Doreen? JEFF: It’s not that glamorous. She got hired [at POET] as a project accountant a year before me. A bunch of people in the accounting group were all about the same age, and we started hanging out. It’s always a good idea for the new guy to start dating someone at work right away. JEFF: Oh, yeah. Definitely. Luckily, it worked out well for me. When we started dating, we were leery about saying anything because we weren’t sure how it would work out. Everyone found out when one of our co-workers got married and we went to the wedding, together, as a couple. We sat next to another coworker and he asked, “Are you guys here together?” That was our cat-out-of-the bag story. That was awkward and interesting. The following Monday the news spread like wildfire. Were you always holding hands in the office? JEFF: [laughing] No, not even close. We didn’t even drive to work together. Our schedules were completely separate. We were married in 2004 and she left POET in 2009, after our son was born. Last year, you left POET for a few months and then came back. JEFF: I had the opportunity to do some consulting, and it was something I needed to explore. After a short period of time, I realized where my talents really lie and that my desire for my career was back at POET. I’m bringing this up because, really, it seems like a great reflection on you and POET. They seem to want the best for the company and the team members, without the “Don’t let the door hit you on the way out” attitude other companies might have. JEFF: They were very professional. I met with Jeff Lautt [POET CEO] and Jeff Broin [POET Founder and Executive Chairman] in my exit interview. Both of those guys told me that if it didn’t work out, to not let my ego keep me from touching base. When I wanted to come back, I had an opportunity to ask James [Moe] to let me know if anything opened up where I could add value to POET. And something opened up. I was very blessed they gave me an opportunity. I got to return to a project I started with in 2006, and that meant a lot. That project is Project LIBERTY. The last few months have been pretty exciting for LIBERTY. JEFF: It’s amazing. I helped write the original grant application in 2006. Project LIBERTY is so much more than anyone realizes. Unless you were there for the design and construction, you won’t be aware of how complex it is, how much stuff is built inside the tanks alone. It’s just amazing the detail our engineers and project managers had to put in. If you were a fly on the wall watching this entire process, it would blow you away how much work has gone in by all our team members. POET’s always been so successful, sometimes we almost take for granted how much hard work it takes to complete a project of this magnitude. How many miles do you run per week? JEFF: If I’m doing run training, between 30 and 35. Now that I’m doing triathlon training, it’s closer to 15. Is that what you do, hobby-wise? JEFF: It’s 90 percent of it. If I’m not spending time with my kids, I’m exercising. Exercise is my stress release. JEFF: I listen to a lot of nutrition and endurance training podcasts when I’m driving or working at home. Drives my wife crazy. I also listen to them when I’m training. You listen to podcasts about running or triathlon training while you’re actually training? That sounds a bit extreme. JEFF: Now that I say it, it sounds weird. JEFF: Getting married to my wife, I say this to everyone, is one of the best things that happened to me. I absolutely mean that. She keeps me grounded about what’s really important in life. We get the opportunity to do great stuff here at POET, but it comes with a lot of stress and anxiety because everyone wants to make a difference. Doreen keeps me plugged into what’s important. And getting to come home and spend time with her and the kids is what’s important. Then, the next day, I get to work on the kinds of things that can change the world. That’s a good life.